As if urging parents to use television or tablets with babies isn’t bad enough, AT&T has partnered with BabyFirst to introduce the first-ever “second screen” experience for infants and toddlers. 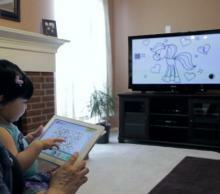 The new BabyFirstTV U-verse app encourages babies to use an iPad while watching TV. The American Academy of Pediatrics recommends no screen time for children under two. When there’s no evidence that even one screen benefits babies, marketing a second one is unconscionable. Please tell AT&T to pull the plug on the BabyFirst U-verse app. Raspberry Pi, a tiny computer the size of a credit card, has captured the imaginations of students, educators and tinkerers around the world since it became available in 2012. Check out the NY Times breakdown here. 1. Sandra Boynton Collection: Popular kids books turned into interactive apps and simple eBooks. New E-Book Subscription Service Debuts in U.K.
Blloon, an e-book subscription service aimed at kids, has launched in the U.K. The company offers new members free access for the first 1,000 pages read. New users can then gain additional access by recommending titles, sharing their choices online and inviting friends to join the service. Tablettoddlers recommends Digital Media: New Learners of the 21st Century, a documentary exploring how exceptional instructors are increasingly using digital media and interactive practices to ignite their students’ curiosity and ingenuity, help them become civically engaged, allow them to collaborate with peers worldwide, and empower them to direct their own learning. Scholastic Parent & Child magazine has released a new ad-supported mobile app called KidQ, which is designed as a conversation starter for parents and kids. The app poses a number of questions such as: Why is the sky blue? Why do we say “ears” of corn? How does your brain talk to your body. The app then gives answers with explanations which readers are encouraged to discuss. Tablettoddlers is a big fan of Disney Infinity 1.0. Our kids have enjoyed hours upon hours of playing the game on the original Wii system. Recently, Disney announced Infinity 2.0, an updated version which includes Marvel superhero figures. Unfortunately, Disney is not making the 2.0 version for the original Wii. So for us, it means shelling out $75 for the updated game, base, and starter pack, along with $299 for the WiiU system. Curious to hear what you think.